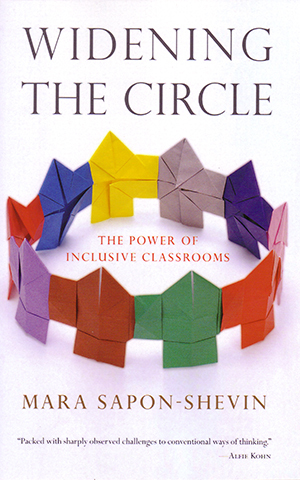 Widening the Circle is a passionate, even radical argument for creating school and classroom environments where all kids, including children labeled as “disabled” and “special needs,” are welcome on equal terms. In opposition to traditional models of special education, where teachers decide when a child is deemed “ready to compete” in “mainstream” classes, Mara Sapon-Shevin articulates a vision of full inclusion as a practical and moral goal. Inclusion, she argues, begins not with the assumption that students have to earn their way into the classroom with their behavior or skills, it begins with the right of every child to be in the mainstream of education, perhaps with modifications, adaptations, and support. Full inclusion requires teachers to think about all aspects of their classrooms pedagogy, curriculum, and classroom climate. Crucially, Sapon-Shevin takes on arguments against full inclusion in a section of straight-talking answers to common questions. She agrees with critics that the rhetoric of inclusion has been used to justify eliminating services and “dumping” students with significant educational needs unceremoniously back into the mainstream with little or no support. If full inclusion is properly implemented, however, she argues, it not only clearly benefits those traditionally excluded but enhances the educations and lives of those considered mainstream in myriad ways. Through powerful storytelling and argument, Sapon-Shevin lays out the moral and educational case for not separating kids on the basis of difference. “Widening the Circle is packed with sharply observed challenges to conventional ways of thinking. It digs beneath classroom strategies to find larger truths about difference, exposing the moral implications of segregation in the process. One by one, Sapon-Shevin skewers the philosophical and practical objections to inclusion. Her book should be read by all educators, not just those in the field of special education.” —Alfie Kohn, author of The Schools Our Children Deserve and What Does It Mean to Be Well Educated?